Welcome to Highland Bunkhouse. This original bunkhouse, built in 1925, has been fully updated to include hardwood floors, granite, new windows, doors, and bathroom. Period light fixtures and antique furnishings add to its charm. Though on the small side, the Bunkhouse is not cramped and has all of the amenities to make your stay comfortable. 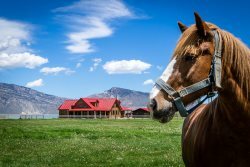 The Bunkhouse is located approximately halfway between Yellowstone National Park and Cody, Wyoming in the heart of the breathtaking Wapiti Valley. It provides access to 42 private acres with Shoshone River frontage, 360 degree Absaroka Mountain views and wildlife in abundance. Relax on your private deck and drink in the beauty of the mountains, hike along the river or see if the fish are biting. Horseback riding, rock climbing, rafting, zip-lining, and boating are available near by. It's a 20 minute drive to the world-class Buffalo Bill Center of the West, the Cody Nite Rodeo and numerous other attractions. Use the Bunkhouse as your home base while you enjoy Yellowstone, a mere 30 minute drive away. Dining, shopping, and entertainment are so close in proximity. Open your windows at night, feel the cool mountain breeze, gaze at the stars and fall asleep to the sound of the river. Escape to the peace and tranquility of Highland Bunkhouse. For larger groups, the Highland Homestead can be rented with Highland Bunkhouse. Contact our office for more information and special rates. communication through email was quick and the one phone call we had to make while there(did not know how to lock the door) was quick-did not have to leave a message to call back. I fell in love with it as soon as I saw it. It was a very cozy stay. We would not hesitate on coming back!! Beautiful country. The weather was perfect, did not miss our back home humidity!! The linens smelled good too:)- Thank you for providing a memorable stay. Very friendly and easy to work with. Will definitely use your company again if going to the Cody area and will refer our friends to you. Beautiful little cabin! Has all one needs for a short trip to this area, We enjoyed Cody & Yellowstone, We saw 6 wolves in Lamar Valley. Beautiful place. What a wonderful place to enjoy the beauty of Yellowstone National Park. What a beautiful little cabin! We spent two days in Yellowstone - so beautiful and unique, the wild flowers are magnificent! We saw bears, bison, Elk, and a wolf in the park. Staying in this cozy cabin made our trip extra special. NO SWIMMING is allowed in the river from this property.